Overview At least 80% of women experience nausea and vomiting. Hyperemesis gravidarum is a condition of pregnancy characterized by intractable nausea, vomiting and dehydration and is estimated to affect ~2% of pregnancy women. Remember that hyperemesis gravidarum tends to begin somewhat earlier in the pregnancy and last significant;y longer than morning sickness. 10-20% of cases may last the entire pregnancy. Reduction in infants weighing >90th birth-centile. 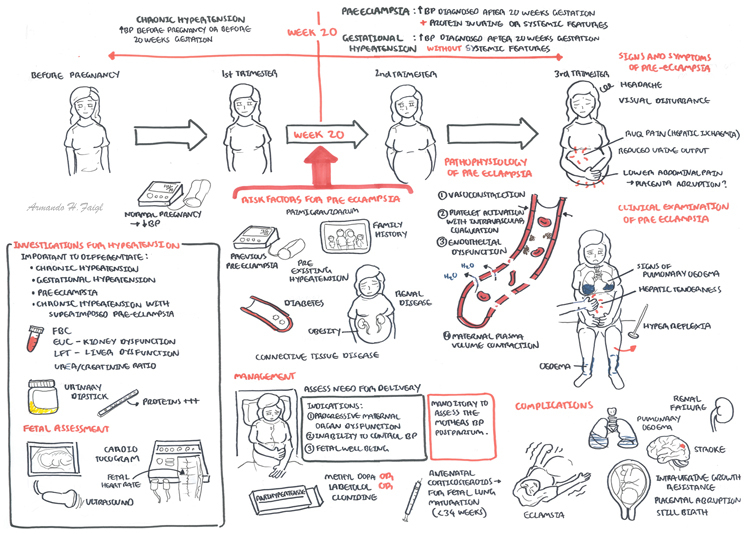 Overview Anaemia is the commonest medical disorder in pregnancy. It is responsible for significant high maternal and fetal mortality, more so in developing nations. In pregnancy there is increase in total blood volume as well as the red blood cell mass. However, the increase in plasma volume (50%) is more then the increased red blood cell mass and total haemoglobin (25%). Thus the blood is “diluted” resulting in physiological anaemia. Iron Deficiency – Oral iron supplements + Vitamin C (orange juice) as this increases iron absorption. Parental iron if oral iron can not be tolerated. Folate deficiency – folic acid given preconception and in early pregnancy to reduce ris of neural tube defects. Daily if high risk of neural tube defect. Cardiovascular morbidity and mortality in adult lives. Affect only pregnant women – occurs in ~5% of pregnancys and mainly occurs in primigravid women. Side note Smoking is said to be a protective factor. Smoking is also protective against Ulcerative colitis and Parkinson’s Disease. Investigation Help distinguish pre-eclapmsia from chronic hypertension and gestational hypertension and to assess extent of condition. Ultrasound: fetal growth/restriction, amniotic fluid and umbilical artery flow. Post-partum management – Manditory to assess preeclamptic women for several months to check if blood pressure returns to normal. Remember ACE inhibitors and Angiotensin Receptor blockers are teratogenics and should be avoided. Diuretics are generally avoided in Pre-eclampsia . Eclampsia means convulsions. It is very uncommon but is very dangerous. Overview Antepartum haemorrhage is per vaginal bleeding during/associated with pregnancy after 20 weeks gestation. Antepartum haemorrhage is usually associated with the placenta. Vasa Praevia: Rare condition in which the umbilical vessels, unsupported by either the umbilical cord or placental tissue, traverse the fetal membranes of the lower segment above the cervix. Remember Never perform a vaginal examination in presence of PV bleeding without first excluding a placenta praevia.